There are many manufacturers of industrial control valves, with each producing an array of sizes, types, construction materials, and other distinguishing characteristics that make it necessary to quickly narrow the field of contenders to consider for your valve application in order to be productive. A useful filter that can be applied to the broad offering of valves is selecting a valve “type”. Valve types are generally classified according to their means of closure, with some common types being ball, plug, globe, butterfly and gate, among others. Each type has particular application strengths, some that may prove advantageous enough for your application to exclude all others. Let’s take a look at butterfly valves. 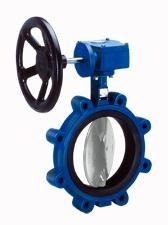 The closure means for a simple butterfly valve is a disc, positioned in the fluid flow path, that rotates around a central axis through a 90 degree arc. The valve stem serves as the axis and extends through a seal to the exterior of the valve body where it serves as an actuation point. The closed position for the valve has the disc positioned perpendicular to the direction of flow and blocking the flow path. When open, the disc is parallel to the flow path, but still positioned in the center of the flow. 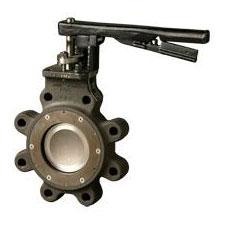 Butterfly valves are available in a variety of construction materials, making them suitable for an array of media. Closure mechanism allows for comparatively low torque operation. Small size and weight for reduced installation space and valve body support. Low pressure drop in the fully open position. The disc, when parallel to the flow path, presents a thin edge of its profile to the fluid flow. Low maintenance requirements and small parts count. Transition from fully open to fully closed with a 90 degree turn provides for fast operation. Suitable for limited range of throttling applications. Throttling capability is generally limited to low pressure drop applications. The orientation of the closure may cause cavitation under some conditions. Choked flow can be a concern under certain conditions. Performance, low maintenance requirements, and cost are always primary considerations. There are many more detailed sources of application information. Consult with a professional sales engineer that specializes in industrial process valves and get the information you need to make a good choice.